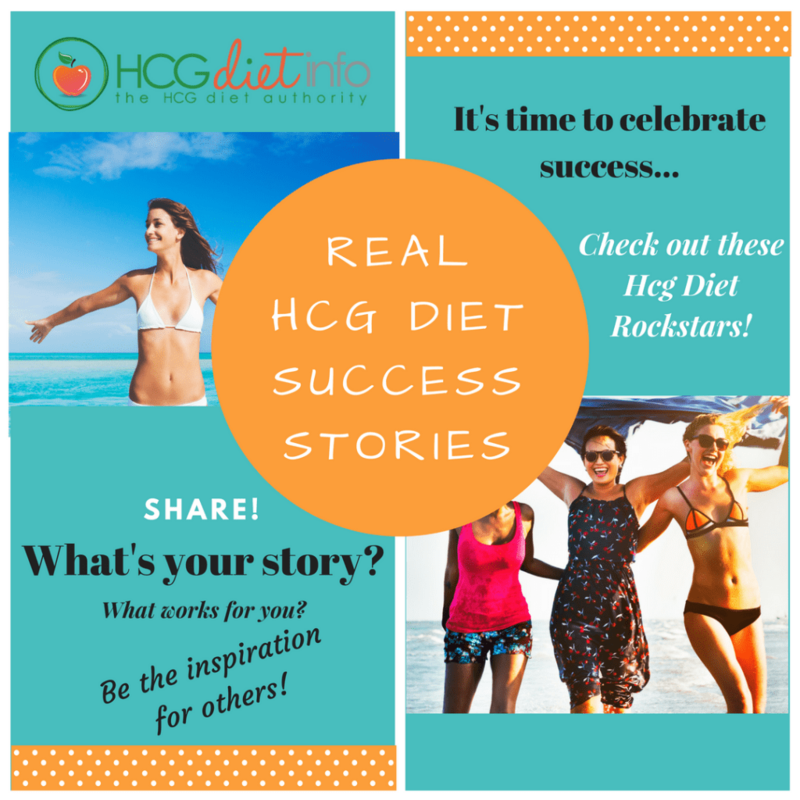 These Hcg Diet Results and Success Stories aren’t just successful Hcg Dieters.. they are true Rockstars! 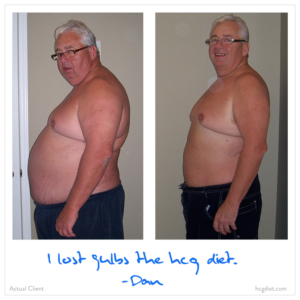 In fact, welcome to the “Hcg Dieter Rockstar Page of Fame!” These guys are our heroes for generously sharing their results, before and after pictures and their Hcg Diet journeys. We are so grateful they took the H6.time to share and inspire others and we are so proud of them for their amazing achievements! 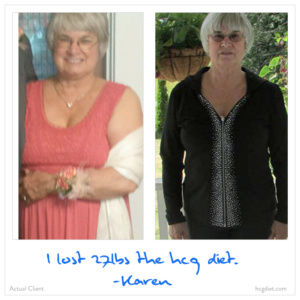 Oh, and if you haven’t read it already, feel free to take a few minutes and read the HDI Founder’s own personal Hcg Diet success story- a 90 pound loss maintained for over 10 years! 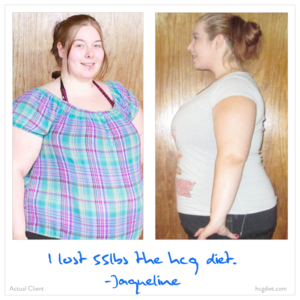 Jen’s Hcg Diet Journey – my 90 lbs Success story using Hcg Diet Injections. I was 240 pounds at in the pic on the right. Less than a year later, I had lost nearly 90 pounds with Hcg Diet Injections and kept the weight off. In 2017, I lost another 45 pounds with Hcg Diet injections, after having a baby. 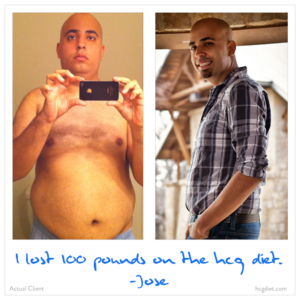 This diet has changed my life and that is why I was inspired to start the first Hcg Diet site on the web. Since then, HDI has had over 100 million visits, and 2 million pages of information. It has been the highlight of my Hcg Diet journey. Back to the Size I was Before I got Pregnant. 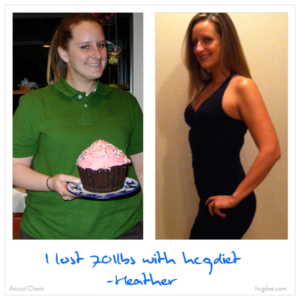 Heather, This is one of those Hcg Diet Success stories that inspires determination and focus. Loss = 70 pounds! Amazing Chelsea! I started struggling with my weight later on in life. Growing up, I was an athlete and my weight was naturally under control. However with college came complete freedom and I ate what everyone else ate: junk. I started to gain weight. Over the next decade of my life, I started to gain more and more weight until everything came to a peak in 2010. I was injured in the line of duty as a peace officer during a disturbance. I needed back surgery and was informed I would be unable to return to my position as a peace officer. For most of that year I was depressed; I was unable to exercise, participate in sports, or return to the job I loved. So I did what I knew best: I ate. A lot. In 2011, three months before my 30th birthday I decided that an extreme change was needed if I was ever going to be happy. I visited my aunt, and was astonished that she had lost 50 pounds and looked amazing. 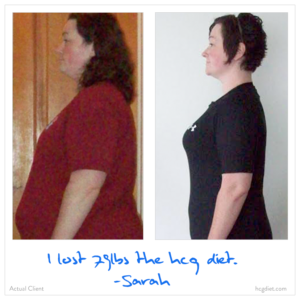 She informed me that she used the HCG Diet Plan and had kept the weight off. Almost immediately after starting the diet, I felt better about myself. I had this renewed feeling of confidence and I felt like I had control over my goals. Most people doubted me and told me I was crazy. They said that I wouldn’t succeed, that I would gain it all back plus more. Their negativity simply increased my motivation and drive. After two 40 day rounds, I lost a total of 70 pounds. That’s quite a bit of fat and misery gone! Currently, I am back to my high school weight and have gone from a size 18 to a size 8. A size I never even thought possible in high school! So far I have referred 20 of my close friends and acquaintances with life changing results for each of them. Even a perfect stranger, (who works at the plus size store I used to shop at,) was inspired with my weight loss and has also lost over 70 lbs on the HCG diet. I Could Actually See Results FAST! 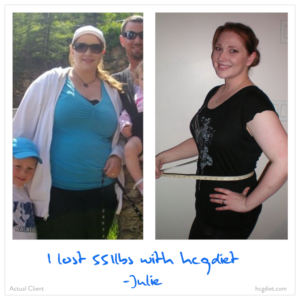 Hi my name is Julie S. and I have lost 55 lbs so far on the HCG Diet!! I have had problems with my weight since high school.. Always known as the chubby one.. My self esteem was low and was always looking for a way to lose the weight. Then I had kids and it got even harder.. Being on bed rest made me gain even more.. And then I found HCG.. and oh my goodness.. I could actually stick to something and see results fast!! It has been the best thing I have ever done!! Thank you HCG for helping me take my life back! I Have Maintained my Weight for 11 Months My name is Calcia ,28, mother of two boys 5 and 7. 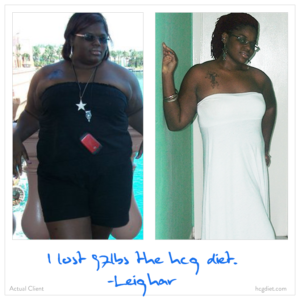 I started my hcg diet on November 24,2010. My weight at that time was 223 lbs, and bodyfat over 30%.. I was tired all the time,body aches, had no energy and was not happy the way my body was looking. I kept hearing about this diet called the hcg diet, I went home researched it online and found what I thought to be the best diet. I found HCGdiet.com, bought the product and started my diet. For the first week it was hard to eat 500 calories but it got easier as the weeks went by. For the first 5 days I checked my weight and I already had lost 7 lbs . I was shocked. I couldn’t lose that in a month. I completed my 23 days and my total lost was 45 lbs ,over 20 inches and my body fat went down also to 25%. I was really amazed. Who wouldn’t be so happy with results like that in little time? So I must say I have been maintaining my weight now for 11 months. I have been working out now doing zumba and weight resistances. I feel better, healthier and happier. I am 65 Years Old and am Feeling Great. My weight before starting with the drops was 177, and I wore size 14 jeans. When I finished with the first 40 days, I was down to 153 and could wear size 10 slacks and size 12 were baggy! My lowest weight when on maintenance was 149, and currently have stayed between 150 and 152 pounds. I went to Mardi Gras in New Orleans, and gained about 6 pounds, so I went on the drops again when I came home and was able to lose back to my maintenance phase quickly. For some reason, my body wants to stay here at this weight. In the fall, I will do another round of drops and see if I can get at least 10 more pounds off. 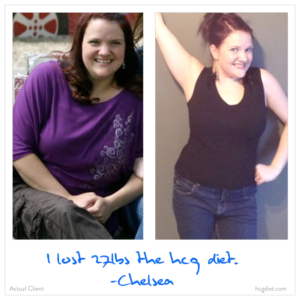 A 100 pound Hcg Diet success story! Jamilynn 50 pounds lost to date. 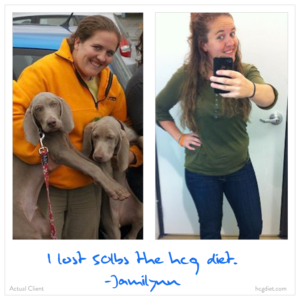 Jamilynn also achieved a 32% loss in body fat which is spectacular. We have to tell you Jamilynn, you look at least 10 years younger now too! I’VE BEGUN TO TRULY ENJOY LIFE AGAIN. My first round I lost 30lbs in 40 days. Second round I lost 20lbs (18 during P2 and a 2lbs during P3 while maintaining). So I’ve lost a total of 50lbs. I went from 187lbs to 127lbs. I’ve lost 32% body fat..gone from obese to normal weight range! From squeezing into a size 12/14 to comfortably wearing a size 4! I’ve gone from wearing big baggy t shirts and sweatshirts to trendy form fitting clothing. I hated shopping and now I really enjoy it (although my bank account doesn’t enjoy it). I was embarrassed to see friends or family and spent a lot of time sitting on the couch not doing anything. Now I’ve begun to truly enjoy life again. An inspiring story from a full time Mom with a crazy busy schedule. 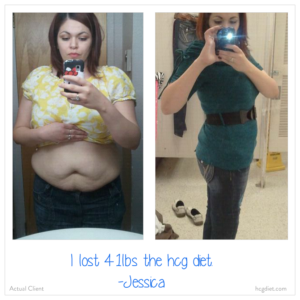 Jessica experienced a 41 pound loss on a single round of Hcg. Busy and on the Go as a Full-time Mom, Employee and Student. My husband’s aunt introduced me to the Hcg Diet and I am so extremely thankful and blessed to have found it! I had never tried an actual diet and I was determined to give it my all. I knew that I was depressed because of the situation I am in and I also knew that carrying aroun d the extra weight was not going to help me in my recovery. So I started the diet at 206 and ended the 26 day round at 178 and am now down to 165. It has been such a blessing to be able to lose weight so easily. Being that I am unable to actually work out or even go out for a walk, cutting calories was not going to help, but the HCG diet did! I did it! Before I started the diet I came up with a 2 week meal plan so that I would not fail myself. I also made a chart where I wrote what I ate and if I liked it. I recorded how I felt for the day and this helped me plan out future meals. I really liked the meals I had. I liked them enough that I fed them to my family and they liked them as well! Carrie experienced a loss of 6 dress sizes, 9 inches around her waist, and a total of 31 pounds. 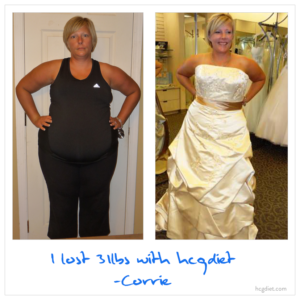 The Hcg Diet saved her wedding day! 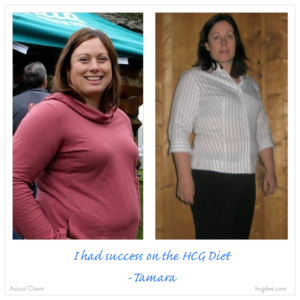 …and even MORE Hcg Diet Success Stories! 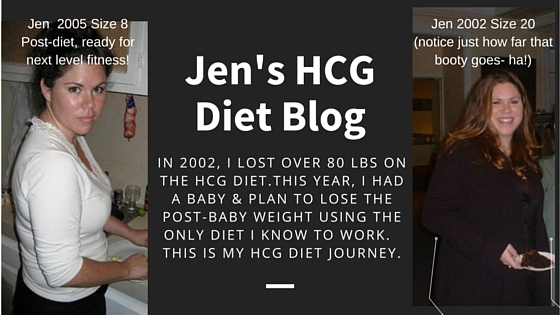 We love this Hcg Diet success story! Nearly 100 pounds lost and what an inspiring and heartfelt journey. Thank you so much for sharing your success Leighar! We were so touched to receive this particular Hcg Diet success story- what an adorable couple and what a perfect example of loving support and how it can help with the right weight loss journey. Congratulations to Cindi and Wil! Well done! MY DOCTOR RECOMMENDED HCGDIET.COM We have lost 112 pounds collectively (62 for Cindi, 50 for Wil) My (Cindi’s) doctor recommended HCGdiet.com on my annual visit in October, 2010, because she and her daughter had had success with the plan. I filed away the knowledge and when the end of year holidays were approaching I thought more and more about it. 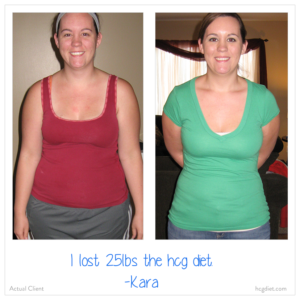 Kara lost 25 pounds on the Hcg Diet after seeing her mother and sister have success on the diet first. Back to the Size I was Before I got Pregnant This is after two rounds of 26 day hcg. i had tried just about everything to try to lose the weight after having my son and was completely unsuccessful. It was very downing trying to lose weight and maybe dropping a pound every week. Then my mom and sister started this hcg diet and at first I was skeptical but after seeing their results the first thing i did was go order a bottle! Now in less than two months I am almost back to my size before I got pregnant and I feel good about myself again! MY SALON CLIENTS HAVE SEEN THE CHANGE AND ARE NOW ON THE HCG DIET AS WELL. I run a salon and my clients after seeing the change in me have become HCG users as well. I have just purchased my first distribution order from you so I can pay our success forward and offer this opportunity to others as well! The part I look most forward to is giving others their ‘uncles’ and fathers and mothers, and themselves back! I feel honored to be a part of the HCG team! I am on maintenance now…sitting at 140 and I have a goal of 125 which I know I will reach when I start my last round next week! Thank you HCGdiet.com from my heart! And from my family!!! 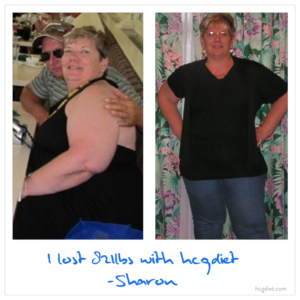 Sharon has help 80 of her friends achieve fast weight loss with HCG. 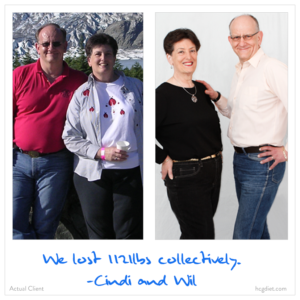 Combined, they have lost over 2000 pounds of excess body weight. What a life-changing angel! I would like to introduce myself to you. My name is Sharon L. I am 52 years old, and have had a weight problem since I was 21. In all those years there were many diets tried and failed. There was weight watchers, metobolic, nutra system, and the list goes on and on. I did manage to take off some weight, but would end up putting it back on. Looking back now, I realize, that none of them teach you how to cook and eat food without adding all kinds of additional fats to them. None teach you to weigh yourself everyday, and if you gain, you know exactly what to do to take it back off. Pictures taken of me were NEVER seen by anyone, and there were many tears, mostly in private, after looking in the mirror. To everyone around me, I was always cheerful and happy. Little did they know I was dying inside, and hated myself. I stopped shopping at clothing stores years ago and purchased clothes I needed online instead, that way if they didn’t fit, I could just send them back. When starting on HCG I was in a size 24 very tightly. 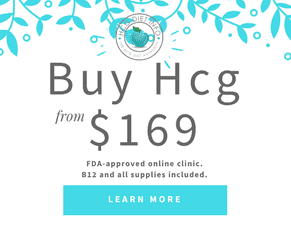 A friend of my daughters told me about HCG, and I immediately ordered it. When it arrived, it sat on a shelf, in my living room for at least a month. I would look at it everyday, and ask myself if I was going to go through disappointment again. Then, on May 12, 2011, I took my daughter and her family to Disney World for the day. My daughter took a picture of me, in a restaurant of all places, and posted it on her facebook page. She meant no harm, but I was mortified, to say the least. 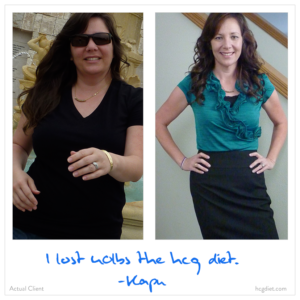 I started HCG on June 1, 2011, and haven’t looked back since. As the weight started coming off, people would ask me what I was doing. Once they asked, they couldn’t stop me from talking about HCG. Before I knew it there were 7 people who wanted to join me on this quest….I explain to people that fighting my weight for all those years, I want to share my personal excitement with them and want them to feel the same, without having to spend a small fortune. I now proudly show my before picture to people and they see me now 5 months later, and can’t believe it. Sometimes I find myself looking in the mirror, and find it hard to believe it myself. I now have over 80 people on this quest with me, and happy to say they are all having the same results. The smile people now see from me is real, and not just a surface smile. Everyone keeps in touch by phone and facebook, and are a great support system for one another. The people near me that are on it, are of all different sizes, and everyone does cloths swapping. That way no one has to purchase new cloths till they have lost everything they want to lose. Total loss of my group of HGC dieters is over 2000 pounds!!!! 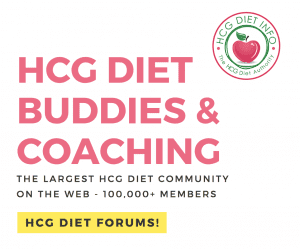 Want to inspire and motivate others to help them reach their weight loss goals with the Hcg Diet? 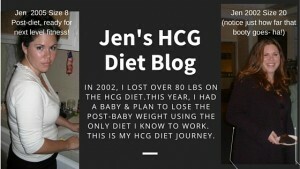 Send us your Hcg Diet results at Hdihealth (@) gmail.com! ’ve been getting my injections since I found out how some of my friends lost weight fast with HCG. At first I had planned to lose 37 pounds. By my nineteenth HCG injection I had lost 28 pounds, and since I only have nine more pounds to go, I know that I am going to come real close to my original goal! I’m going to move right to phase 3 after the injections are done. I’ve got no qualms about keeping a pound or two. Once I get to phase three I will probably lose the pound or two over time anyway. I can’t say I never had the urge to cheat when using HCG injections, but I can say that the hunger I did experience once in a while was nothing like I have experienced in the past. I think the HCG is what really made it easier to work through it: that and the fact that I lost weight so fast..that kept me pushing forward and sticking to the plan because I was seeing results for the first time in my life. Anytime I did get hungry it was easier to say, no way, I’m not cheating because I knew the scale would reward me for my diligence. On other diets I just gave up whenever I hit a plateau and ended up gaining all the weight back and more. The steak days made it possible to quickly overcome the weight loss stoppage so I wasn’t so ready to give up on myself. I won’t say there’s no work involved in this diet, but I will say that the outcome is within reach and oh so enjoyable when achieved. I did the 29 day HCG injection protocol and only fell three pounds shy of what I originally intended to lose when I started the diet. I decided to go onto the 40-day protocol just so I could drop a few more pounds; when I set out to lose weight I figured toward the high end of my healthiest weight potential, so I know I can spare a few more pounds to lose without jeopardizing my health. Already I am getting noticed by people that wouldn’t give me a second glance before. I’m am constantly getting complemented too, which seems a bit awkward at first because I wasn’t sure how to really accept all the comments I was getting, even though they are positive. I am fitting in to clothes I only fantasized about wearing before; now I look good and am feeling so much better about who I am. So far, I’ve lost 31 pounds! I don’t feel camera shy as much as I used to be, and I feel more confident when I am talking to people one-on-one or in a large group. At first I was really nervous about getting injections, but my doctor explained the process and once I had my first one I found out it wasn’t bad at all. I feel really confident that I can talk to my doctor about my concerns too…he treats me like a real person and no question is silly. Every time I go for a checkup I can’t wait to be weighed in just so I can show off to the doctor and his staff how I have lost the weight. It’s nice to be able to get on the scale every morning and to smile instead of walk away in total disgust; I can proudly look into my reflection again. I started the HCG diet doing the drops, but decided to see if the HCG injections were more powerful when it came time to do the second round. I’m glad I made the switch. I think I was afraid about pain when I first started the diet and the idea of getting injections scared me so much that I just refused to try it. I haven’t really had any side effects at all. It pinches a bit when I do the injection, but that’s it. No redness, no soreness, just one fast pinch and it’s done. The kit comes with sterilized water and brand new syringes too, so I don’t worry about infection. I think if I knew then what I know now I would have started the plan with injections for the first phase too. I dropped weight fast with the drops, but it is true that you lose weight more steadily with injections. I also found that the injections themselves were not as bad as I thought they would be. With the injections I ended losing up to pound every day. It took a bit of trial and error in the beginning to make sure I was getting enough HCG in every dose, but once it was figured out, the weight just started melting. I think this is very much due to the purity of the injections that I got and the fact that the injections have got more of the HCG in them. I went with the pre-mixed kit so I didn’t have to mess around with making up every injection all the time. I know this…if when I finally reach my goal weight and I ever have to use HCG again, I’m not going to mess around…I’ll be getting the HCG injection kit right off the bat. I’ve been using HCG injections for a while now. I can’t believe the success rate I have had so far. Right now, I’m on the second to last injection and I’ve already drop another three pounds since my last weigh in…I was at 135 pounds and now I’m happy to say I weighed in at 132. To date I’ve lost 22 pounds and I haven’t even entered into the third phase yet so I will probably lose two to four more pounds over the next two days. I’ve found the HGH injections did curb my hunger a lot and as long as I was creative about different recipes, I didn’t get tired of eating the same stuff all the time. I’ll be looking for more recipes to keep my healthy food interests and I like the challenge of trying to figure out what I can make out of foods on the Simeon’s food list. 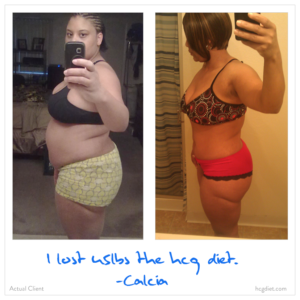 I don’t think I could’ve lost all the weight I did unless I used HCG. The injections really made all the difference for me, and I can’t believe how good I feel. I never thought I would see the day when I would reach a point of looking in the mirror and being satisfied with the way I look. Best of all, I know I’ll be able to keep the weight off permanently because I can use the HCG protocol whenever I notice I’ve put on a pound or two. Somehow a feel whole again and I just know there isn’t a challenge I can’t face. After being disappointed by other diets, it’s nice to finally have found a diet plan that actually worked for me. I highly recommend the plan to others too; everyone is asking me how I managed to lose the weight so fast! I have always had female problems and I knew for a long time it was because of my weight. My doc kept telling me I had to drop some pounds, but no matter what I tried I usually only lasted a few days and then quit. I did the cabbage soup diet, the lemonade diet, the detox diet…you name it, and I’ve probably tried it and always wound up starving and miserable. Every time I failed, I emotionally beat myself up for months. When I heard about HCG injections, I thought it might be another fad thing, but now that I’ve tried it, I know it’s not. I started using HCG injections on May 12 and despite feminine problems I’ve been managing with oral contraceptives, I am losing the weight I want to lose. Steadily I’ve seen at least a pound a week come off. I am hoping that over time, after I finish the full course of injections (I’m doing the 40-day plan), I won’t need oral contraceptives at all to keep my issues controlled. I’ve heard of others having great success after losing weight, and since I’ve got ovarian cysts, I’m thinking that once by body is back the way it should be I will experience fewer problems. I loved the freedom of the load up days, but I don’t miss them a bit. Before I was eating something all the time, now I am sticking to my three meals a day without constantly thinking about what I can munch on! I opted for doing the 800-calorie diet so I won’t have to worry about struggling with hunger pains or not getting enough nourishment; I can’t believe how liberal an 800-calorie diet can be. I can eat less and still feel full.. to me that’s a miracle in and of itself. Learn the about the top FDA-approved telemedicine companies that offer complete Hcg Weight Loss Programs for a fraction of the cost of weight loss clinics, or Buy Hcg Injections and Drops online here. Wnat to see more Hcg Diet success stories? Visit our success stories forum on the Hcg Diet Info Forums!